London Irish have confirmed they are looking for a replacement for retired fly-half Andy Goode. Goode called time on his 18-year career last week after failing to recover from persistent injuries. The 35-year-old's departure leaves the Exiles with three fly-halves in coach Tom Coventry's squad. 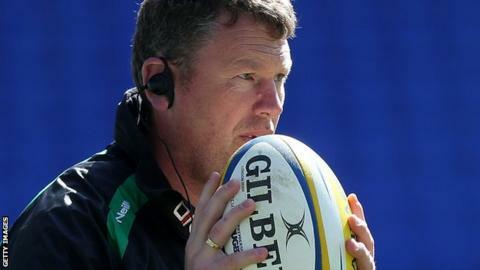 "We're looking at what we want to bring into the team while making sure that it makes a difference," head of rugby operations Glenn Delaney said. "It's a real shame for Andy as we were desperately keen for him to play for us. "Our medical team worked tirelessly to give him the best opportunity to get himself fit. But, I guess the carry over of things that needed repairing for him from last season weighed into his mind on the decision to call it quits," Delaney told The Blarney, the club's official podcast. Irish have Chris Noakes, Shane Geraghty and 18-year-old Theo Brophy-Clews as their remaining fly-halves ahead of their opening Premiership match against Leicester on 18 August. "Like anything in this game, it becomes a case of sliding doors. One door closes, another opens," Delaney said. "We're in good shape, but notwithstanding that we need to make sure we have adequate numbers in the squad."